did give me some energy after all. I love your denim jacket & shades! Totally adorable! Love this look. LOVE the jumpsuit! And you have such a good figure to pull it off! Amazing outfit! That jumpsuit is gorgeous, you look great! Hi, dear! Im totally in love with your jumpsuit! I'm a fan of jumpsuits ! yours is a wonderful piece ! Oh man - that's such a unique jump suit! I really love how you break it up with the jean jacket. The light blue is the perfect color to go with the purple of the suit. 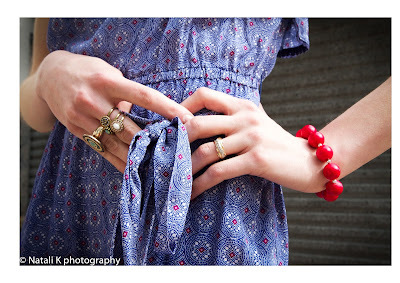 The red bracelet is such a cute little accessory. What kind of lense are you getting1? Jealous! Have a great shoot! I also woke up 5:30 this morning. I love your ouflit so much. Love that look! Super chic! This jumper looks so perfect on you! Very charming! Natali, you look so amazing! That jumpsuit is so stylish and I love your photos, they're just perfect! Very cool look!! I really like it! J'aime beaucoup ton combi! tres chouette! obsessed with the jumpsuit on you! Ja ih inače obožavam, pre svega zbog udobnosti! nice! you have a grat blog, now following. come check out our blog. hopefully you can return the follow. =). you're really amazing for pulling off this patterned jumper look! love it! also the purple really looks nice on you. This is such a fun jumpsuit, I love the color and pattern on you and the denim jacket is always a great addition! Post up pictures of your new lenses! love the colour of your jumpsuit! !